Apart from Pandya who can do this job? This is where our main weakness is. We are the worst in the last 10 overs in recent times. We could 290/6 in 45 overs we will still struggle to cross 310. How to maximize this? Either top order has to stay till 50th over or lower order freaking has to learn to hit some sixes. By throwing in random numbers, are you implying that we should be 240/3 vs 290/6 after 45? And then we use the last 5 overs to get to 290/6 after 50, when we were at 290/6 at 45? 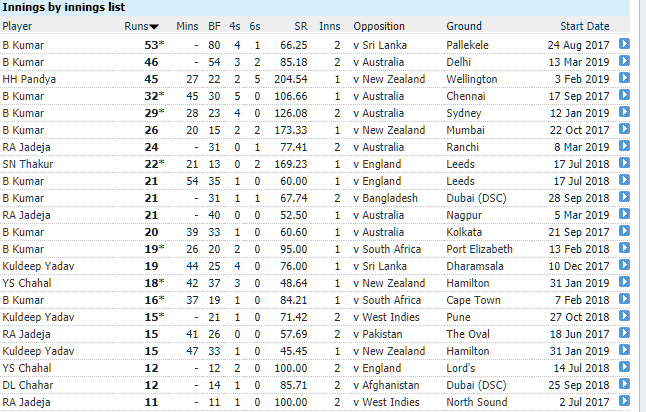 My concern is last 4 batsmen (assuming Bhuvi doesn't make it to XI based on bowling form), not last 10 overs. Guarantee the 4 duds in our tail won't be able to collectively score 10 runs against any side no matter how many overs are left. This is pathetic, even in '83 we had bottom 4 of Binny, Lal, Kirmani, Sandhu...in the final we were 6/110, 7/130 and then 183 ao against Roberts/Holding/Marshall/Garner. Indian tail being dud mean Indian middle order has to play with uber caution. There is a cascading effect to this. Anytime we have a decent partnership down the order it was either with Jadeja or Bhuvaneswar. Neither of them are going to be in the playing XI. It will be Chahal, Kuldeep, Shami, Bhumrah. 4 rank tailenders. We could 290/6 in 45 overs we will still struggle to cross 310. How to maximize this? And MO usually bat in middle overs where have the opportunity to play with caution, so what is the point? On batting friendly pitches in Eng, it could be difficult to get all and where you would expect your batsmen to do well (in fact make the most of it) .... and here we have folks worrying about lower order that includes #10-11, who may not even get to bat too many balls that often! Their super duper useless batting will force the middle order to play cautiously. There is a cascading effect to it. In the last 5 overs teams can score as much as 60 to 70 runs. In order to do that you need a bit of contribution from the tailender. Atleast sticking around. We don't have anyone. Are you seriously suggesting India will not lose more than 5 wickets in any match before 40th over? Yes. India leaves it too late because our tail is uber thin. Both Bhuvi and Jaddu won't play to help the score. Even they can be hit or miss. Till now India has never played a match where Chahal, Kuldeep, Shami, Bumrah all played together. FIrst time India will play in the world cup. Again the numbers for tail of various teams are already posted. Ind is as good or as bad as many of the other major teams .... A lack of Jadeja and Bhuvi where applicable would be compensated by playing on good batting surfaces which provides more opportunities to the other batsmen .... I expect MO to play as per the situation in the middle overs. If there is a ball to be hit, it will be hit and vice versa! India collapses for 158 against Pakistan on a good batting surface. one the top order was blown away. You are picking the only line of 290/6 not "besides Pandya who can do this". Dhoni is past it. He can't produce 20 run over against high class fast bowling. Jadhav hit or miss. Either Kohli or Rohit has to stick around till 40th over for some magic. Dhawan is useless in the end overs. Not sure who is going to be our no.4. Explain why India is below even minnows in the last 10 overs last year scoring at 5.78 runs per over on an average. It’s sports. At times, you play good, at times bad. At times, the other team has a great day like Ind had in the final of 83 .... Ind got bowled out for 125 at Sharjah and still won .... It is all part of the game. You put your best put forward. In the end, good teams and players play good cricket more often than not! So you cannot automatically assume we will get batting wickets and we will do well on all batting wickets without a collapse. You could collapse on a good batting wicket too You may need a bit of help from the tailender to push the score to a respectable total. Even against Bangladesh we have collapsed a few times. 2007 world cup two collapses in a row with a mighty batting line up. Explain why India is below even minnows in the last 10 overs last year scoring at 5.78 runs per over on an average. Dhoni is past it. He can't produce 20 run over against high class fast bowling. Jadhav hit or miss. Either Kohli or Rohit has to stick around till 40th over for some magic. Dhawan is useless in the end overs. Not sure who is going to be our no.4. As long as the top 7 can protect their wickets and go at a reasonable rate we will be fine. Any middle order collapse will lead to under par total like we had against Australia in the last series. 233/6 at 45th over to 250 all out with Kuldeep and Bumrah couldn't even take the game to 50th over. India's best bowlers can't bat for sh*t. Players with reasonable batting potential are not exactly as good as the other bowlers. This will be the case especially when we bat first. Average will give you a false picture. It is about the ability of batsman sticking around. Pretty much the same thing we saw in Test matches where a little bit of resistance from tail would have earned a couple more test wins. Sam Curran purely with his tailender batting skill won 2 test matches. Not very dissimilar in one dayers. Shami averages 4.4 Bumrah averages 4.5 Chahal averages 8 Kuldeep 12. in the last 2 years. Their average is 28 runs between them. Santner, Ali, Rashid, Woakes, Southee, Cummins, Jhye Richardson all can better than any of these 4. Infact Cummins and Jhye Richardson won a match scoring 14 runs in the last over. You really think these guys can do? We have had Kumble, Srinath, Zaheer, Agarkar who could all bat or stick around in the past. You are looking at a perfect scenario where top 7 will always score bulk of the runs. This line up is not cut to do that. Even with Tendulkar, Gambhir, Sehwag, Yuvraj, Dhoni, Kohli, Raina we needed at times tail to wag in 2011 world cup. Against South Africa, England, Pakistan. In all those matches India needed tail to wag. Zaheer/Nehra/Munaf/Bhajji failed on each occasion. This line up can't hold handle to that line up. This is an unreliable middle order. The data is posted here of how the guys in lower order have done recently and includes players who all played of their teams! What is the highest score of some of their players compared to ours. Santner has got a 50. Woakes got a 50. Moeen ALi, Rashid both can hit 50. This average will not make Moeen Ali = Shami , Rashid = Kuldeep, Santner = Chahal. Again misleading stats. India had guys like Bhuvaneswar, Ashwin, Jadeja down the order in odd matches. You are not going to have them in the world cup. Secondly about the "most of the time" 160 innings by top 7 46 innings by bottom 4. That doesn't sound like most of the time. Any stats that you pull will not reflect what i say because these 4 never played together even in a single match. You don't make these collective comparisons and convince yousrelf Indian Tail = English Tail = NZ Tail = Australian Tail. INdian top order > Mot of the teams. With two at the top going through a rough patch, there might be top order collapses. India's best case scenario is top 3 batting (Esp. Rohit/Kohli batting till 40th overs atleast ). Aging Dhoni, unreliable Jadhav, rookie Shankar, Pandya have to do the acceleration between themselves if top 3 didn't survive till 40th over. Nobody is changing any goal post. I commented about two issues. Scoring in the last 10 overs and Weak tail. If you seriously think importance of tailender batting is irrelevant then you are living in an alternate world. You somehow try to project Indian tail is as good as any other tail which everyone will laugh at. Even the mighty Australia needed the services of Andy Bichel not once but twice in 2003 world cup to bail them out. Someone like Sam Curran, Santner, Archer, Holder, Coulternile can all hit the long ball. It allows the middle order to start the acceleration early. There are many cascading benefits. Your theory probably fits in the 70s where tailenders will be genuine tailenders. You are talking about a perfect scenario. But in world cups collapse will happen. In Asia cup final Bhajji smoked Amir for a six to help India win. Same way Rajesh chauhan smoked a six to help India win their first match in Pakistan. In 1996 world cup. Kumble/Srinath helped Ajay Jadeja in the end overs big time. Your eutopian theory is not applicable even for world beaters. No team has had a near perfect world cup. The team is all about top 3 + Bumrah + KulCha and Shami if he turns up motivated. No one else is a match winner irrespective of who we pick from this WC 15. Already posted “recent” data of what happens more often than not. This is not perfect scenario. Already talked about this being sports so there is unpredictability associated with it. Already talked can’t plan for poor cricket. But as usual, you have resorted to strawman and the black and white thinking where either you can play fast or get out for e.g. pandya is the least qualified to do that job. It is the job of a specialist and not a part timer. Jadhav isnt that bad, his problem comes when he has to come at 40/4 kind of situation . Here is the list of all the no 8-11 batsman in the last 2 years from all countries minus Bhuvi matches. Jadeja is not even in top 100 in this list. Yes if you have completely set of useless batsmen in the back end your middle order will definitely slow down. Heck even Kohli will try to take it to the deep or throw his wicket away. In the last years Lords one dayer, David WIlley came at 239/6. England ended up with 322/7. Willey made 50 in 31 balls. How can you say England has a weak tail with Moeen/Rashid coming in at that place. Yes weak middle order makes the extremely weak middle order even worse than it is. You are saying Indian tail is as good as tail from any other team. I am the one making irrelevant strawman posts lol Nice try. "On batting friendly pitches in Eng, it could be difficult to get all and where you would expect your batsmen to do well (in fact make the most of it) .... and here we have folks worrying about lower order that includes #10-11, who may not even get to bat too many balls that often! " How a weak tail have a cascading effect, how tailenders have won matches. You have ignored every point. You are still sticking to "they may get to bat" "our tail is the same as other tail" Sorry. You are expert at missing the point. Did xyz score a 50 in a random game? Yes. Data shows 50 scored too. Yes, that too! That has been the problem since 2015. Indian tailenders have been non existent for long long time.Some people have no clue , you are spot on about cascading effect on whole lineup. England can go for broke from ball one as they have batting till no11, Indian batsmen cannot do that, India has no ability to chase down big totals.